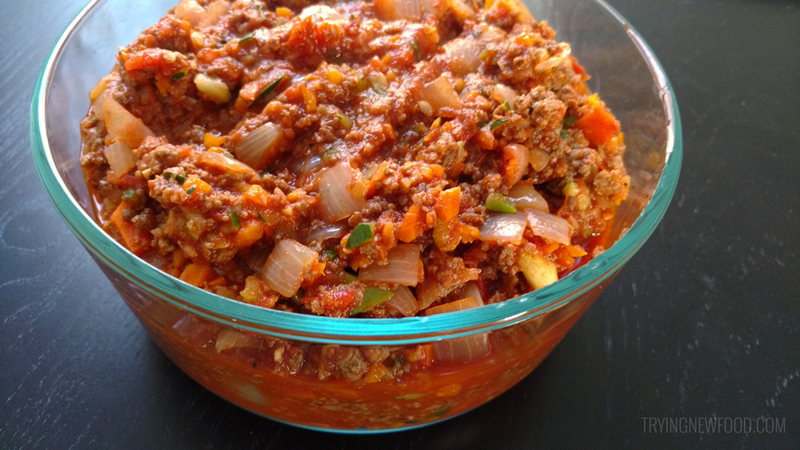 I craved this veggie and meat spaghetti sauce all year. Due my silent reflux, the doc told me to avoid eating tomatoes along with other acidic foods. So no citrus fruits, fried foods, coffee, or chocolate. Well it’s 2017 and I’m feeling adventurous! I’ve also been eating small amounts of all the foods I was told to avoid and haven’t had any problems lately, so I should be okay. This is a recipe I found on Budget Bytes, and I absolutely adore it. I made a few adjustments to simplify it even further so it’s super, SUPER easy to prepare. Add around a tbsp or so of olive oil to a dutch oven or large pot and put on medium heat. 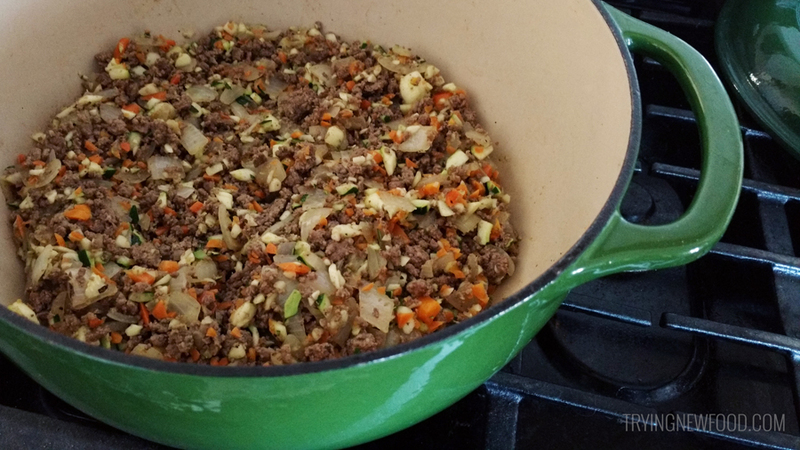 Add ground beef, break apart and brown until cooked through. While beef is browning, dice the onion. Once the beef is browned, make an opening in the center and add the onions to the middle of the pot. Then mince the garlic while the meat and onions cook. When onions are softened and almost clear, make an opening in the center and add the garlic. While the onion and garlic cook, finely chop the zucchini and carrots. 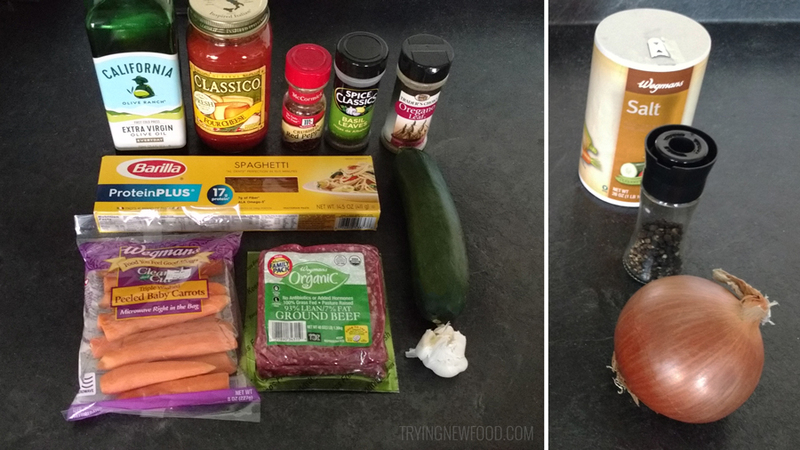 I used a Food Chopper , so I cut the zucchini in 1″ slices and put 2 slices in at a time and finely chopped them up. Add all the zucchini and carrots to the pot with the basil, oregano, some fresh ground pepper, salt, and a dash of red pepper flakes. Cook until veggies are tender, around 8 minutes. I taste test the largest piece of zucchini and carrot I can find to check if all the veggies are done cooking. Pour the pasta sauce into the pot and mix in, heating on low. 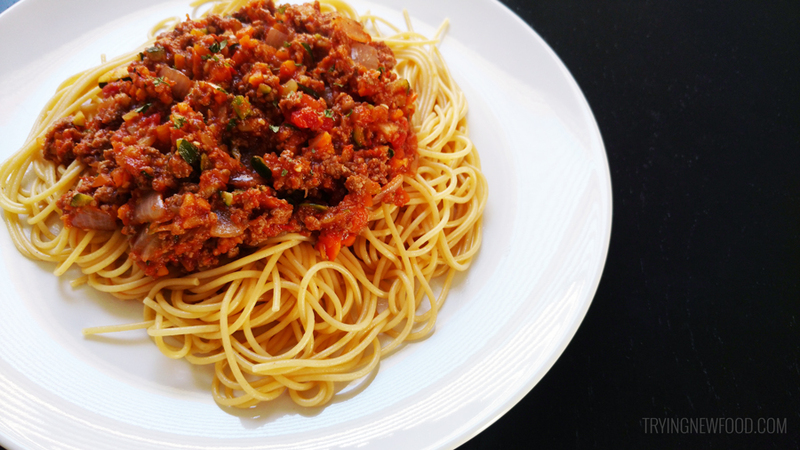 Prep as much of the spaghetti as you need. We usually end up with half a box of unused pasta, so I made the whole box. Cook according to box directions. Drain pasta in colander and return to pot with heat off. Divide up pasta into bowls and top with sauce. Since there’s only two of us, I toss the extra pasta with a little olive oil so it doesn’t stick together, then store it in fridge for later.